The week started off well after the recent bad weather with up to 11 Great White Sharks on a single trip. Visibility was limited due to the recent big swells and still calming swells. This was a break between the storms as the next 2 days were off the sea again with huge swells and driving wind. Two of the boats managed to get back on the water on the Wednesday and there were up to 7 Sharks seen on the trips, it was a bit blustery but the sharks were in good form. Thursday was calm and beautiful and we had up to 12 Great White Sharks around any one boat with fantastic viability at the Island at 9 meters. We had an excellent day on Friday with flat seas and brilliant sunshine. It was a little chilly but the sharks were in awesome form with up to 16 Great White Sharks on a single trip! The underwater visibility was 8 and everyone was having the times of their lives out there at the Island. On Saturday we were blessed again with great weather and up to 10 Sharks around the boat and with up to 5 sharks at any one time and 7 meters visibility! One of the clients added “There are Sharks Everywhere” which summed up the mood well and to top it off one of the boats had a Humpback Whale breach very close-by. Sunday was the best of all with warm Sunny conditions, flat seas and excellent visibility at 12 meters. We had over 12 sharks around the boat for the trip. Sunday was a great day out at sea with 12 predations on Seals at Seal Island and 7 Seal kills. They attracted 6 Sharks to the boat for the Cage diving with moderate visibility of 4m. The next day out was on Wednesday with it being a quiet day on sea due to limited seal movement in and out of the Island. 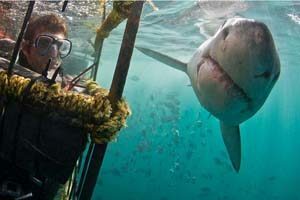 The cage diving was good however with 5 sharks attracted to the boat. Thursday was also a little slow for breaching with 7 predations on seals and 5 seals consumed with 5 sharks attracted to the cage for the diving. Friday was excellent with 9 predations and 5 seals taken and double breach on the decoy. We also fitted in a Seven Gill Cow shark dive with 17 Cow Sharks spotted. Sunday was a little bumpy but the Whales love the rough seas and many breaches were witnessed. Monday and Tuesday were fairly slow on the water if you do not count the hundreds of Dolphins and Whales in the water. Wednesday had some bait balls but the seas were rough and we were not able to get to where the action was happening. On Thursday we experienced a few small balls of Red-eye but with many sharks, dolphins and Gannets in action. Friday was another quiet day on the water for the Sardines. There was plenty of marine life in the water to snorkel with and some nice underwater encounters had with the Humpback Whales. Summarizing, there is not a great deal of Sardine Run baitball action but everyone is having a ball out there snorkelling with the sharks, dolphins and Whales in the meantime. Limited dives at the moment due to all of the focus being paid on the Sardine Run down the coast in Port St Johns but Raggie season is in full swing so great dives all round! Revolution Slider Error: Slider with alias review-of-week-28-06-13 not found.